I could easily use my whole word count on a list of things I wish I'd made. But, OK, I'll pick one. 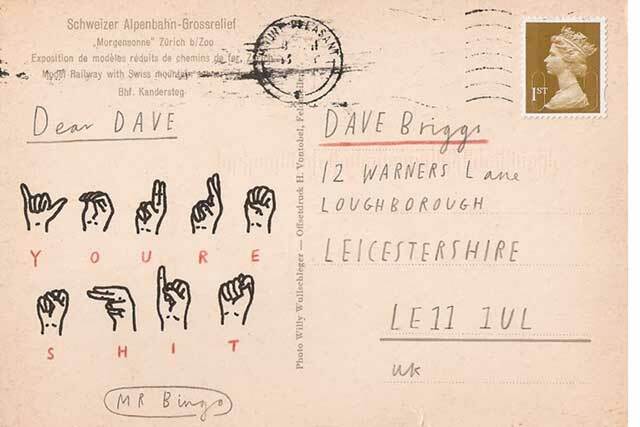 Mr Bingo and his Hate Mail project (http://vimeo.com/34951319). I didn't come across this myself (though I've always liked Mr Bingo). Jack Starks, an account guy here at Fallon, shared it with the agency last week. And I just loved it. Why? Here, I should probably write some stuff that makes me look like someone really smart, with knowledge of art, philosophy and trends. Well, I'm smart (a bit, at least). I know a bit about art, though not too much, to be honest. And I know absolutely nothing about philosophy. Put simply, the reason I like it is because I find it fresh, brutal, aggressive, funny, naive and beautiful all at the same time. It's a really silly idea (let me tell you that silliness is a great thing), executed brilliantly. It's also so real. It's not pretentious at all; it's just a very honest thought from a very good artist. It's hard for me to define it. What is it? A piece of art? A piece of communication? Both? I'm not sure if the story behind it is true or not, but I quite like to believe in what he is saying; I would like to believe that a drunk artist and a stupid Tweet built this up from nothing. I also like the fact that there are so many people out there ready to embrace these kinds of games. Ready to engage in dialogue, to participate. I love it because it shows in a dramatic way how far most brands, and most agencies, are from having a proper, real dialogue with the real people out there. Who would have thought that someone could ask people if they wanted to receive aggressive messages, have loads of people respond "yesss!!!" and then get them to pay for it? Another thing I love is that he has combined two things from different worlds, from different ages. We all spend hours trying to find ways to be cool, and techy, and modern, and this guy has done something super-cool by mixing Tweets, drawings (not even Photoshop was needed here) and snail mail. I would love to have done this because of all the above, because the work is just hilarious, and mostly because I'm a frustrated illustrator and the art on this is, in my humble opinion, just amazing.